GIS is evolving, and a whole new pattern is emerging. Web GIS integrates many innovations and provides everyone with the geographic advantage. If you were not able to attend the 2015 User Conference last week in San Diego and hear my opening remarks on Monday morning, I’d like to share my thoughts about how GIS is evolving. GIS is being influenced by and integrating with all kinds of new innovations such as faster computing, big data, the cloud, smart devices, and distributed processing. At the same time, we are measuring everything that moves and changes on the planet with drones, Lidar, sensors, and other new tools. These two forces are coming together to provide a platform for a whole new generation of apps. This new pattern is called Web GIS. And this new Web GIS pattern is also changing how we implement GIS. It’s allowing us to implement it in a more configurable pattern. Rather than customize and write everything from scratch, we can take ready-to-use technology and apply it and begin working right away. Web GIS is a transformational architecture that helps us realize this vision. And it’s not a replacement technology. It opens up our existing tools and our existing ways of doing things, integrates them, and simplifies everything. 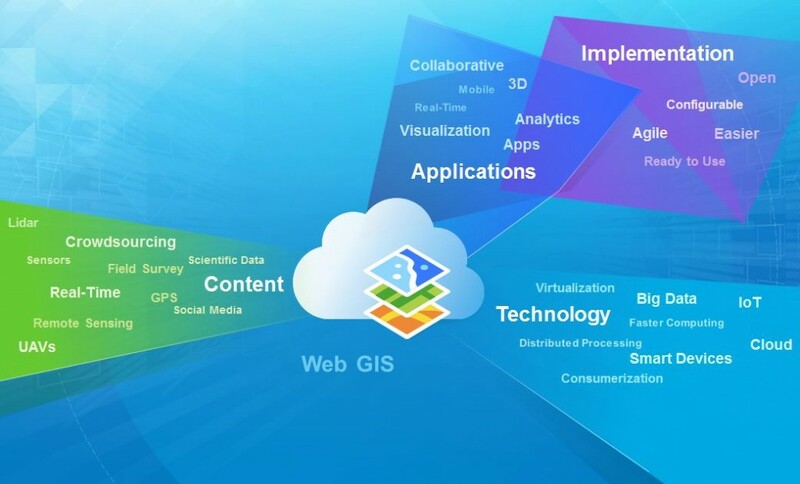 Web GIS is a transformational architecture, opening, integrating, and simplifying everything. It brings together your existing systems to create a system of engagement. Web GIS allows us to take our systems of record—our traditional server and desktop technologies—and integrate them, bringing them together into a system of systems. At the same time, it lets us create a system of engagement, meaning: I’m connected through my devices and my apps. I’m operating in real-time. I’m sharing. I have an identity. I have a role. I’m participating in a larger system. This ability to bring systems together and create a system of engagement means that we’re moving to real-time GIS and connected GIS. Web GIS, this new pattern, empowers GIS professionals. It allows you to expand your impact across your organization by developing apps that not only serve you, but also serve knowledge workers, executives, and casual workers in your organization as well as engage citizens. And by leveraging the whole new world of the open data community, Web GIS truly provides everyone with the geographic advantage. Web GIS empowers GIS professionals, expanding their impact across the organization and providing everyone with the geographic advantage. As GIS professionals you already have access to this advantage. You are the domain holders. I want you to think about how you can take that domain knowledge and get it across to everybody else. That, to me, is going to be the big thing that really changes everything. This Web GIS pattern is transforming organizations, and we can already see the beginnings of it today. A number of organizations are already using Web GIS to create shared information and facilitate collaboration, and it is literally changing the way organizations operate. Web GIS transforms organizations, creating shared information and facilitating collaboration while opening access and engaging everyone. Traditionally, the IT infrastructure was hierarchical. It was stovepiped. We had different departments that operated at the operational level and at the planning level, and then finally a few at the management level who could make the decisions. It worked very well, and for some organizations, it will continue to work that way. But there’s also something else going on. With this new Web GIS pattern, we’re able to open access in organizations so everybody can use it and benefit from it. We’re creating shared understanding around a shared corporate asset of geographic knowledge. This is transformational to organizations. This Web GIS pattern is also creating connections across organizations. The city of Los Angeles had this very vision. The mayor said: I don’t want to just have open data. I want to have open services so that startups in my town can take the government’s data and integrate it to create new innovations. And I want to have data in my town served right into schools, so kids can have access to the data that we’re spending millions of dollars maintaining. And likewise, citizens and NGOs and utilities, and even businesses, creating a new kind of community around the concept of shared geographic knowledge. That’s a big idea, and I’m sure many of you’ve actually had similar visions. But with this new pattern—this sort of overlay on your existing systems, this pattern of systems and engagement—it can actually be accomplished rather easily. Awakening the world to the power of Web GIS requires more than technology; it’s going to take the leadership and creativity of GIS professionals. Waking up the world to the power of this Web GIS isn’t going to just be a technical task. It’s going to require creating a shared vision of empowering people with maps, delivering engaging apps, and creating a culture of sharing. And it’s going to require good people like yourselves and your colleagues to bring this shared vision from idea to reality.